By the late 1960s, many of us in my generation had pretty much had our beliefs in God, country and traditional morality watered down to pitifully weak broth. Mainline churches increasingly didn’t even believe their own teachings. Patriotism was dealt a severe blow by the national identity crisis over the Vietnam War. The glowing reports of the sexual revolution made old fashioned morals seem not only quaint, but stupid. If you were missing out, you were not only square, you were a chump. It was only natural that we would adopt values from the popular culture of the time. And the most influential popular culture of the day for the young was music. Thankfully, there were some voices that seemed to have a moral compass. Bob Dylan, for example, started out as a folk-protest-poet, and never stopped looking for truth, going down whatever roads it took him. But prophets like Dylan were scare and rare. A good part of the steady diet we heard on the radio was more on the level of “Light My Fire” or “Let’s Spend the Night Together.” Teenage libidos probably didn’t need any extra encouragement if you know what I’m talking about. Set to a catchy tune with some nice acoustic guitar licks, the song’s poison message is wrapped in layers of cotton candy lyrics. Love the one you’re with, love the one you’re with. That there is some great relationship advice. Just great. Apparently, I’m not the only one who hates the song. Even former front man of punk bands Scratch and Jesus Lizard, David Yow — an expert in vile lyrics if there ever was one — agrees with me. He says he hates that song so much he’d like to choke Stephen Stills to death. I wouldn’t go that far. I’m just chagrined that I once thought it was a cool song. It’s a pity that tranquility couldn’t last. But with the band singing “love the one you’re with” every night, how could it possibly last? Of new, the old will flutter down–they must. Notes: Some of my favorite poems compare the death that comes in the autumn to the end of a love. Or poems that use the dying natural world when winter approaches as the backdrop for the story. Or Thomas Hardy’s Neutral Tones, which uses a frozen landscape as the setting for the realization that a relationship has ended. I may never have discovered Ransom had it not been for my 11th grade English teacher, Paul Hagedorn, back in Marshall, Missouri. We spent an inordinate amount of time on poetry that year. The major assignment, as I recall it, was to select an American poet from a lengthy list, and then immerse yourself in the writer’s work, and finally write a paper. Knowing nothing about most of the choices, I picked John Crowe Ransom solely because I liked the sound of his name. I got lucky, because I discovered I enjoyed his work. Had I chosen Wallace Stevens with his difficult, cerebral verse, I probably would have flunked. Another assignment was to prepare a notebook of our favorite poems. I remember making daring choices, including song lyrics by such radicals as Paul Simon and Bob Dylan. Now that Dylan as been awarded the Nobel Prize for Literature, I consider myself foresighted. I was fortunate that Mr. Hagedorn approved of my choices. He was the cool, young teacher back then. He managed to fan the flames of inspiration and love for poetry. They smoldered for years, flaming up now and then, and have finally started burning here in this blog. I owe some of my enthusiasm for poetry to my 11th grade English teacher back at Marshall High School in Marshall, Missouri–Paul Hagedorn. He devoted an inordinate amount of time that year to the study of poetry. Our major assignment for the whole year, as I recall, was two-fold. We were to create a poetry notebook in which we copied — and illustrated, if we desired — a good number of poems that spoke to our hearts. Mr. Hagedorn passionately believed that Walt Whitman was the greatest poet that had ever lived and he did his best to infect his impressionable students with this enthusiasm. I dutifully bought a paperback copy of “Leaves of Grass,” and read the whole thing. I failed to completely fall in love with Whitman. Some passages were interesting and hypnotic. I recognized some of the cadence of the King James Bible, which I was raised on. He clearly was making an ambitious attempt to encompass the breadth and depth of all of America in his work. I appreciated that he was attempting to do something had not been done before in American poetry. But I never could figure out why my teacher was such a Whitman nut. One poem that did thrill me, however, was “When Lilacs Last in the Dooryard Bloom’d.” I understood it was an elegy to President Abraham Lincoln, who was assassinated on April 14, 1864, just days after the end of the Civil War. Lilacs were my mother’s favorite flower, and she had passed along that enthusiasm to me. So I was predisposed to be open to any poem about lilacs. One other factor, just a few years earlier, America had celebrated the Centennial of the Civil War. I can remember fighting the Civil War during recess in grade school. Back in my hometown in the heart of “Little Dixie,” there were plenty of kids who had inherited Confederate sympathies from their families. As the great-grandson of a Yankee soldier, I was clearly a Northern sympathizer. So, one year, I recall us dividing up and re-fighting great battles out on the playground. Lincoln was a revered figure in my family. So, that made an elegy to him even more interesting. As I re-read Whitman’s poem today, decades later, it feels a bit overdone. I had forgotten it was so long. Just my opinion, but Old Walt could have used a good editor. I mourn’d, and yet shall mourn with ever-returning spring. It’s been a tough year for lilacs here in the Northwest. We had such a warm and early spring that many lilac bushes were tricked into blooming too early. 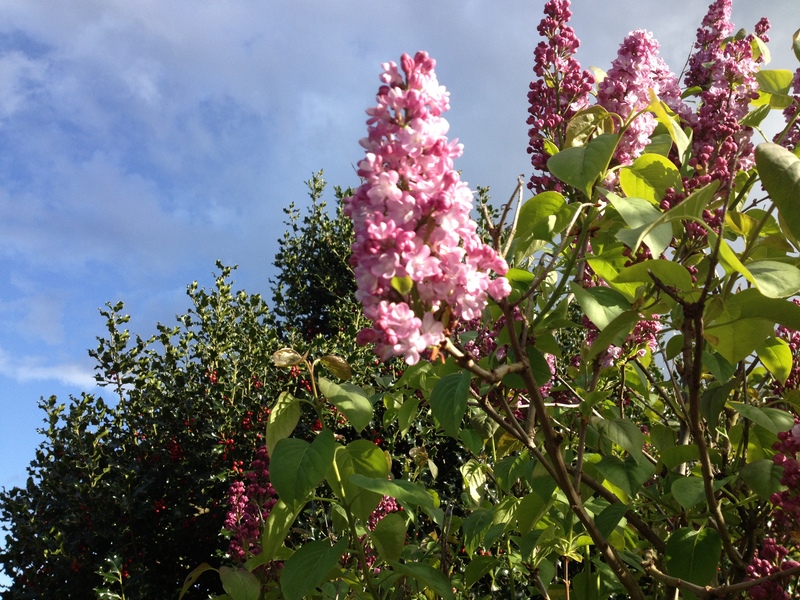 Our premature spring was interrupted by some cold clear nights that nipped many lilacs in the bud. Pity, because there is nothing quite like the heart-shaped leaf and the perfume of the lilac.